I’m absolutely thrilled to introduce you to a simple skillet zucchini casserole dish called Shakshuka which can serve as breakfast, lunch or dinner (win win all around!). It’s a deliciously simple vegetarian meal that’s dead simple to make and the bonus is that you probably have all of the items you need in your fridge or pantry. Served with a hunk of crusty bread or toast, this dish is pretty outstanding and very fresh and healthy. It’s paleo, keto and low-carb friendly! 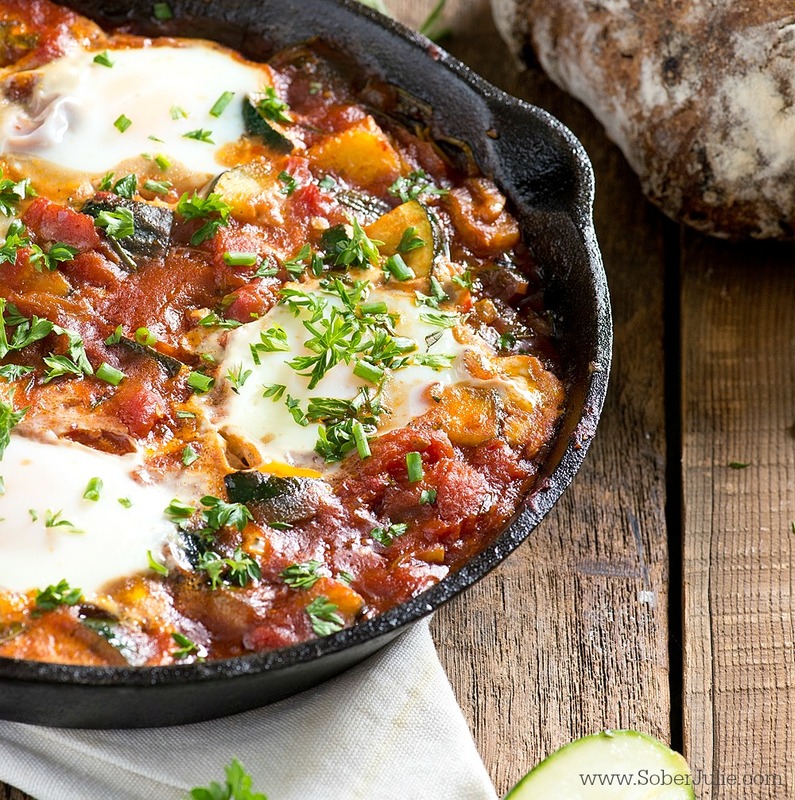 Shakshuka is a popular Middle Eastern dish that essentially means eggs poached in a spicy tomato sauce. 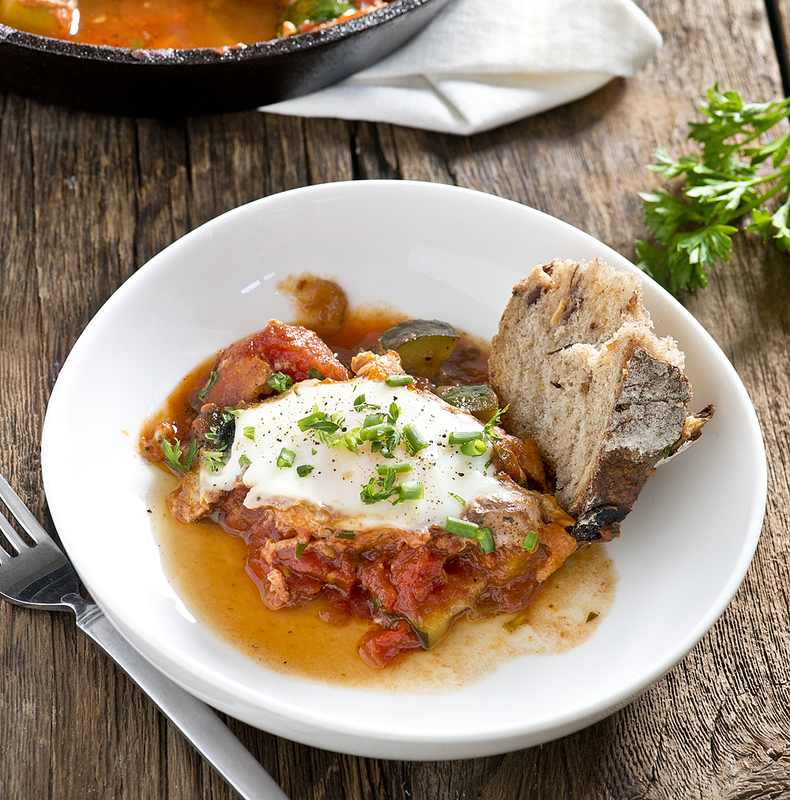 The dish is made in a skillet and the eggs are nestled in to the veggie packed sauce and then finished off in the oven. Add as much spice as you wish, I only use chilli flakes (add some cumin too if desired!) and customize the dish to suit your needs. 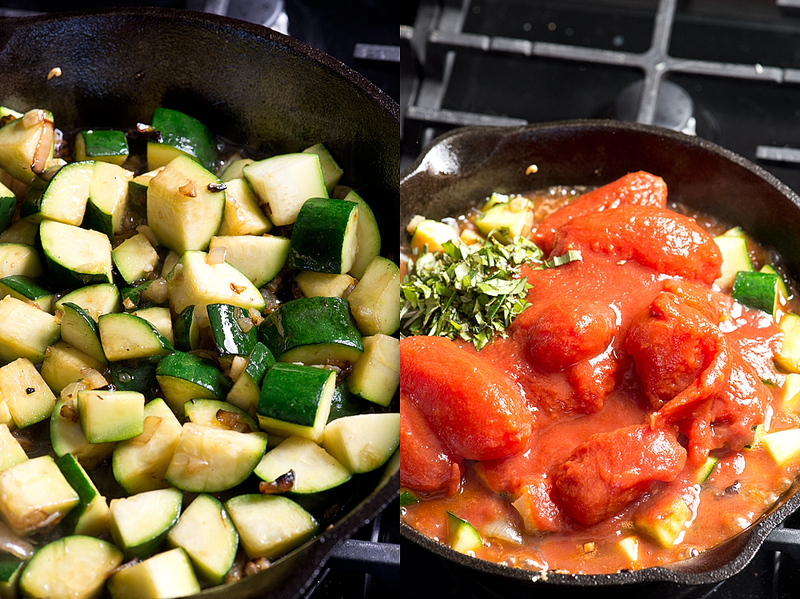 I’ve used lots of zucchini here, which is an abundant, and favourite summer vegetable in our house. It takes on the flavour of any dish and is really versatile to cook or grill with. And, you’ll have to look at your local grocer for plum tomatoes that are packed in puree. 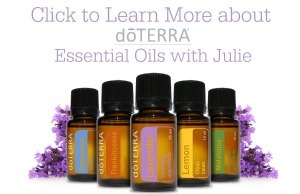 Most stores carry them. I’m always delighted to eat eggs for dinner. They are definitely part of our weekly dinner rotation. Maybe it’s because it makes a Monday night feel like a weekend? Cut each zucchini in half and chop into bite-sized pieces. Chop the onion, garlic and all of the herbs; set aside. Drain about half of the puree off of the tomatoes; set aside. Heat the oil in a skillet over medium heat and add the onions. Use a wooden spoon and saute until golden. Add the garlic and saute for approximately 4 more minutes until you see the garlic starting to brown slightly. 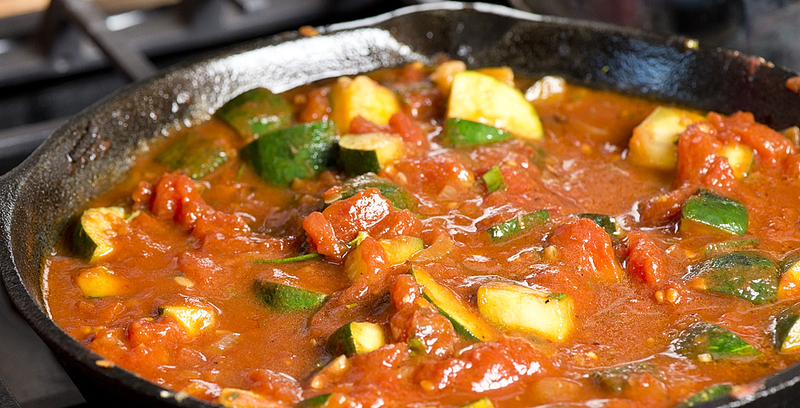 Add the zucchini and continue to saute for 2 minutes. Add the tomatoes, herbs, pepper, salt and spices and turn the heat to low. Simmer for approximately 5 minutes, until it reduces slightly. Use your spoon to break up the tomatoes. Make 4 indentations in the sauce and crack an egg into each hole. Immediately place the skillet in the oven and cook for 15 minutes or until just the whites are cooked on the eggs. Keep a close eye after 10 minutes so the eggs don’t overcook. Serve immediately, family style, with chives and grated cheese if desired. Make 4 indentations in the sauce and crack an egg into each hole. Immediately place the skillet in the oven and cook for 15 minutes or until just the whites are cooked on the eggs. Keep a close eye after 10 minutes so the eggs don't overcook.